victims falling to the ground. The shooter is walking away from you and immediately turns around a corner toward the floor-to-ceiling display windows. a) Draw your gun and follow him in hopes of ending this lethal and dangerous threat? b) Shelter in place and call 9-1-1? c) Shelter in place while drawing your concealed weapon to be ready in case he comes back or there are other shooters. And then you call 9-1-1? d) Draw your handgun and stand in plain view as a protector of those behind you? On a calm, nothing-happening September 2018 day, an active shooter event in the atrium of a large office building should be a significant warning to carriers of defensive firearms. 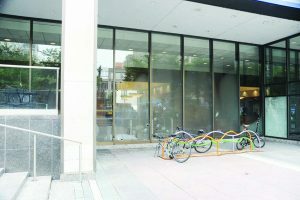 The scene was typical of many city or suburban office, bank or retail businesses – large plate-glass windows that not only create reflection, shadows and dirt issues but also voice restrictions. 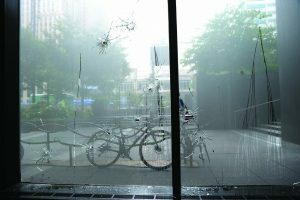 The shooter, carrying a handgun and dressed in inconspicuous pants and shirt, normal attire for late summer entered the Fifth/Third Bank and Office building in downtown Cincinnati where he randomly opened fire on innocent persons. As the people around him dove for cover, the gunman walked through the lobby as casually as someone arriving to make a deposit or take the elevator to any of the upper floors of this 30-story facility. He carried a briefcase slung across his shoulder. Had one of his arms not been outstretched in front of him, he wouldn’t have looked out of place at all. However, at the end of that outstretched arm was a 9mm handgun that spit 35 rounds in a span of 4 minutes, 28 seconds killing three strangers and injuring many others. Less than five minutes is an eternity, literally, when you could be the next target. Due to the central city location and noon hour, a number of foot-patrol police officers were within hearing distance of the shots-fired and responded in force. The first LEO arrived in 55 seconds. Seeing a man with a gun shooting, but partitioned from the officers by plate-glass, they could not give or receive verbal input and thus opened fire shooting through the glass, killing the gunman. Within nine minutes after the sound of gunfire, the scene was deemed secure. The gunman succumbed to multiple 9mm shots fired by police through the glass. According to the Hamilton County, OH, Coroner’s autopsy, the fatal shot was a head wound. a) Error, wrong, ctrl/alt/delete, mistake … The threat is out of your sight and is not a direct danger to you or to another person. Chasing after the shooter, no matter how good your intentions, might find you being ID’ed as the criminal shooter by another legally armed citizen or by the responding police. In this worst-case scenario, the glass separation would exclude verbal commands from the police and also your shouted claims that you are not the criminal shooter! You are not a police officer and have no such authority to follow an active shooter, gun in hand. Even plain-clothes cops, trained to hold their badge case up and in plain view in such situations, could be misidentified by the uniformed LEO responders. b) Yes. This is your best option – along with observations to assist in the follow-up investigation. c) No. With your gun in-hand, you could be regarded as the active shooter or a second shooter by responding LEOs. Further, you could be charged with assault in jurisdictions where pointing/brandishing a firearm is a criminal offence. d) No. See c) above. Even though you might know exactly what is taking place – glass, partitions, physical barriers, reflection/optical illusions, ambient noise and other confusing factors can produce conditions that are not evident to others – especially others who are armed.